This project, to identify and assess the remains of a ‘lost’ stone circle, first described in the early 18th century, took place in December 2010. The site of the former circle survives as two large standing stones (SAM An 022), one at 4m tall, being the largest standing stone in Wales. The standing stones are situated 300m south-west of the Neolithic henge of Castell Bryn Gwyn. 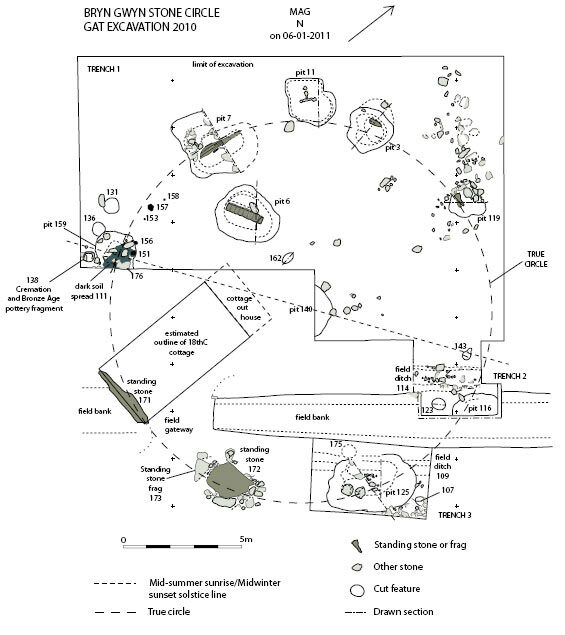 The standing stones were investigated by geophysical survey in 2007 and three new standing stone pits were then identified by excavation in 2008. Two of the stone pits, together with the two surviving stones indicated the arc of a circle of 16m diameter. In 2010 the pits of three more removed standing stones of the circle were identified, making seven identified in all of the eight expected to make up the circle. 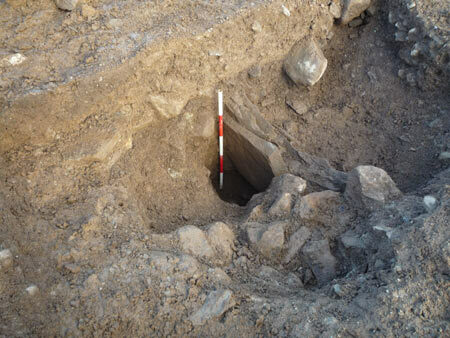 Two of the pits excavated in 2008, which contained the stumps of broken-off standing stones, were re-excavated to locate and sample original pit-fill for possible radiocarbon dating evidence. There were no in situ artefacts in the surviving original fill of the pits. Eight small features, probable post-holes, were found on the edge of the south-east quadrant of the circle. One of these produced a piece of a probable small collared urn (F. Lynch, pers. com.) and a cremation deposit containing the remains of four individuals, one infant (neonate), one young infant, one young juvenile and one sub adult or adult (G. Tellier). The identification of a major stone circle on Anglesey is of great archaeological interest and to this must be added the likelihood that the circle was linked with the nearby henge at Castell Bryn Gwyn, probably forming a ceremonial landscape, perhaps linked to the nearby channel of the River Braint, now silted up. A preliminary report on the excavation was produced (GAT Report no. 942).